We specialize in residential & commercial trenchless pipe repair, replacement & installation services in Canton & surrounding Ohio communities. As a licensed plumbing company we have over 20 years of experience and all of our technicians are highly trained & experienced to handle all of your trenchless needs from pipe relining to pipe bursting. Contact us today for a free no obligation estimate. We can than review the best options with you. With over 20 years of experience serving property owners in Canton and surrounding Ohio communities you can count on our highly trained & licensed technicians to preform your service professionally and at an affordable rate. Our experience comes from a background in Residential, Commercial and Industrial Plumbing Service. Our extensive experience in the plumbing code and trade sets us apart from your typical trenchless company and allows us to understand your particular situation. As such, we are able to recognize the best possible options for you. We have been performing trenchless installations for over 4 years and have developed a wide variety of experience in the field. Trenchless technology is not always the best or most cost effective option for the customer. To find the best solution for your problem, we will come out and assess your damaged pipes for free. Using state of the art cameras and a variety of other locating tools, we can give a very accurate assessment of the extent of your problem. From that point we can then offer you options concerning the best possible solution to your specific need. Once the estimate is given and the job accepted (permits and weather permitting), we can begin work immediately. We specialize in all trenchless pipe services in Canton & surrounding Ohio communities. We are dedicated to your satisfaction and ensure your downtime, if any is limited. Call today for a free estimate from a local and licensed technician. We can help answer any questions or concerns you may have. We are a licensed plumbing company with the required training & experience to handle all of your pipe repair & installation needs. Why choose trenchless over traditional repairs? With traditional sewer repair method you have to replace the pipe completely, often wreaking havoc to your homes beautiful landscape including driveways, flower beds, lawns as well as any water features, trees or bushes. This can be a very costly venture for a home or business owner as now you have to pay to have the trench dug, the pipe removed & replaced as well as any part of your landscape to be redone. With the trenchless pipe method we are now able to reline or replace old sewer pipes without needing to dig up and ruin everything above the old line or in its path. This type of repair is a faster and more seamless approach and also allows for a pipe to be repaired or replaced in a shorter amount of time with a line that is stronger and has a longer lifespan than that of a traditional pipe. What are my options when it comes to trenchless repairs? Pipe Relining is often used for pipes that have developed holes which cause leaks within your plumbing system. These leaks need to be repaired immediately to prevent a more costly repairs and dangerous situations in the future. With pipe relining we first start off by using our video inspection equipment. This allows us to know where the problems are and just what it will take to fix the problems found. The next step is ensuring all pipes are cleared because to ensure the job is done correctly we first need to have a smooth, unblocked passage to each end of the line. The next step is to inject the lines with a liquid designed specifically for no dig pipe repair that flows down the pipe filling any cracks and/or holes it comes across along the way. Once this is completed we finish the process by repairing or relining the pipe. Pipe Bursting is used for a total replacement of an old pipe with a new one of the same or larger size. With this method a pipe bursting machine splits the current pipe and puts the new pipe in its place, composing the old pipe into the soil. Any line can be taken care of with pipe bursting, from sewer lines to water mains and natural gas without the need of excavation or damaging your landscape. Both pipe bursting & pipe relining can save the home and business owners from tremendous amounts of downtime, while in some cases also allowing the property owner the opportunity at saving money on a sewer repair. To decide which is the best option for you, call to schedule a free consultation visit from one of our licensed & experienced technicians. We will take a look at your drain-line issue and decide which is the most advantageous option for you. 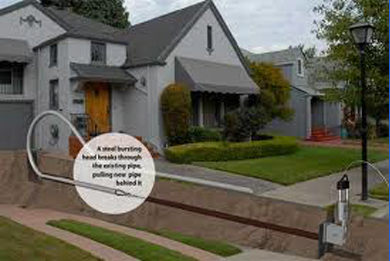 Call the Trenchless Guys today for all of your repair & replacement needs in Canton Ohio. We serve the trenchless pipe needs for both residential & commercial property owners throughout North Central Ohio including, Tuscarawas, Holmes, Wayne, Coshocton, Carroll, Ashland, Muskingum Counties of Ohio Call 330-231-6935 to schedule a free estimate!